The charging cables and car phone charger from ZUS are designed—and tested—to be extra tough. Like, military-tested and approved tough. The cables are even backed by a lifetime guarantee. During testing, the charging cables went through 15,000+ bends without breaking, which is 50% more than other cables. Thick, braided Kevlar fibers prevent weak points and splintering, which make these cables virtually indestructible. 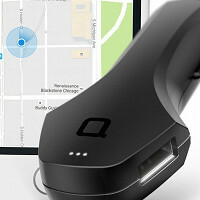 The ZUS Smart Car Charger works twice as fast, and is twice as tough, compared to usual chargers. And this charger is connected, too, so you can track things like mileage, battery life, and even locate your parking spot through the companion app. We’re guessing your daily life isn’t as rigorous as the military’s, but no matter what, these rugged chargers will keep you powered up. Hi everyone! I’m happy to introduce nonda’s ZUS Smart Car Charger to The Grommet. Please let me know if you have any questions, and I will be glad to answer them! Does this charger work with Samsung S7 edge phones? @John Hi John, yes, this charger will charge your Samsung S7 Edge up to 2.4A. And will it work with USB-C phones (i.e., Nexus 5X, Pixel...). Thanks. @Daniel Hi Daniel, no worries! Thank you for your interest in the ZUS Smart Car Charger! This looks great, but I just can't justify spending $50 for a charger and cable! I wish you the best of luck! Please note the bundle option is now available, as well. So not only do you get our ZUS Smart Car Charger that charges at double the speed of your standard charger, you now get two of our Super Duty Cables with lifetime warrantees so you’ll never need to buy another cable again! 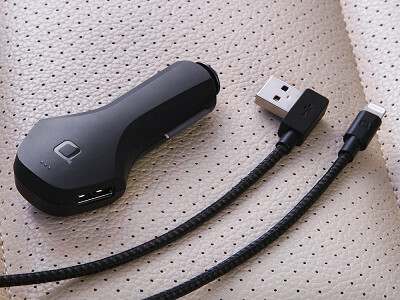 The charging cables and car phone charger from ZUS are designed—and tested—to be extra tough. Like, military-tested and approved tough. The cables are even backed by a lifetime guarantee. During testing, the charging cables went through 15,000+ bends without breaking, which is 50% more than other cables. Thick, braided Kevlar fibers prevent weak points and splintering, which make these cables virtually indestructible. 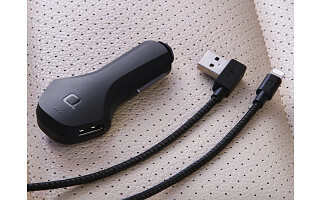 The ZUS Smart Car Charger works twice as fast, and is twice as tough, compared to usual chargers. And this charger is connected, too, so you can track things like mileage, battery life, and even locate your parking spot through the companion app.